Inspiration for future work? » What to do next... any ideas? What medieval theme to look into next, any suggestions? Armed "civilians" ..and maybe camp followers. I'd like to see more men at arms levies etc sure the Knights are great but more sets like the spear men and shield wall perhaps some archers of light cavalry like hoblars I'm saying this from a war gamers point of view value at sets are fantastic and I'd like to fill out my whole 12th century army with your miniatures. 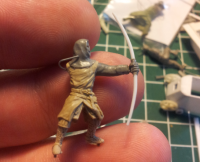 And also a set with 5 archers is in progress and hope to show masters in a month or two. So here are some of the sets in progress. But also I would like suggestions for small theme sets like: Battlescenes, medieval training, execution or ???? 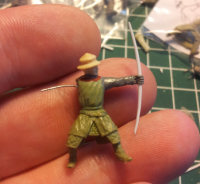 Archers are at the work table and masters should be ready in a few weeks. More females, especially the working class and seeing as women (in the main) spent a lot of thier life pregnant, pregnant looking women.